"Rolled breaded chicken breasts stuffed with Jarlsberg cheese, smothered in a light brown gravy and baked. Hearty and filling. Serve with mashed potatoes or broccoli and a salad. Manga!" Pound the chicken breasts to about 1/8 inch thickness. In a shallow plate or bowl, mix together the bread crumbs and parsley. Place a slice of cheese on each breast, roll up tightly, then dip into the egg and then the bread crumb mixture. (Note: Hold roll closed; after dipping, you will see that it begins to stay together). In a large skillet, saute garlic in olive oil. Add roll ups and brown quickly, just enough for the chicken to have a crisp outer coating. Remove roll ups from skillet and drain on paper towels. Pour 1/2 of the chicken broth into a 9x13 inch baking dish. Add all four roll ups. Bake uncovered in the preheated oven for 45 minutes, basting once with the remaining broth. 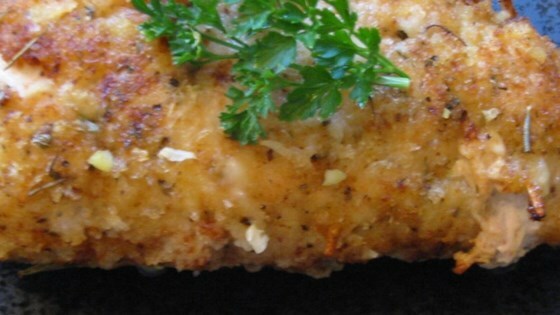 Baked chicken with a crispy crumb coating and a creamy, savory surprise. Not exactly an inspiring dish, but very tasty. Might as well make chicken cordon blue. Same amount of work for a more impressive flavor. Absolutely delicious. Rolling the breasts took some getting used to, but was well worth the effort. Very elegant. I will make again and again!! Simple, tasty and nice presentation. I used Swiss instead of Jarlsberg.